Barcelona striker Samuel Eto’o has moved a step closer to joining Inter Milan after agreeing personal terms with the Italian champions, his agent has revealed. Eto’o is poised to end what has recently been an acrimonious five-year stay in the Catalan capital. He was the club’s top scorer last season with 34 goals, but annoyed the club while being courted by English club Manchester City, leading coach Pep Guardiola to state that it would be best for the club if the player left despite him having been offered a new contract. Two years ago he was criticized by former teammate Ronaldinho after refusing to come on as a late substitute following his recovery from a broken leg. 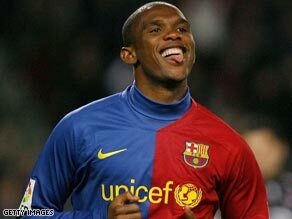 Eto’o will leave the Nou Camp as the fourth highest goalscorer in the club’s history, and netted in both finals as Barcelona won the Champions League in 2006 and 2009. On Thursday Barcelona bolstered Guardiola’s strike force, announcing an agreement to sign Keirrison from Brazilian club Palmeiras. Barca will pay an initial $20 million for the 20-year-old forward, who will undergo a medical on Friday and sign a five-year contract. Meanwhile, Inter’s veteran France midfielder Patrick Vieira will be assessed again this week to determine whether he needs to have surgery. While Ibrahimovic’s wrist injury was not as serious as Inter first feared, Vieira may need to have an operation after it was revealed that he had torn a ligament in his left index finger.